Try a free online demo of the energy auditor course package offered by Professional Home Inspection Institute. 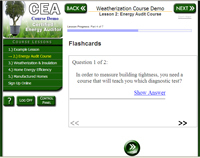 This demo provides information about the weatherization training courses while giving you the opportunity to experience for yourself how the interactive online learning system works. To start your demonstration course, register by clicking the link below. After you have completed the registration form, you will receive a username/password by email. Enter that username/password in the login fields at the bottom of the page to get started!